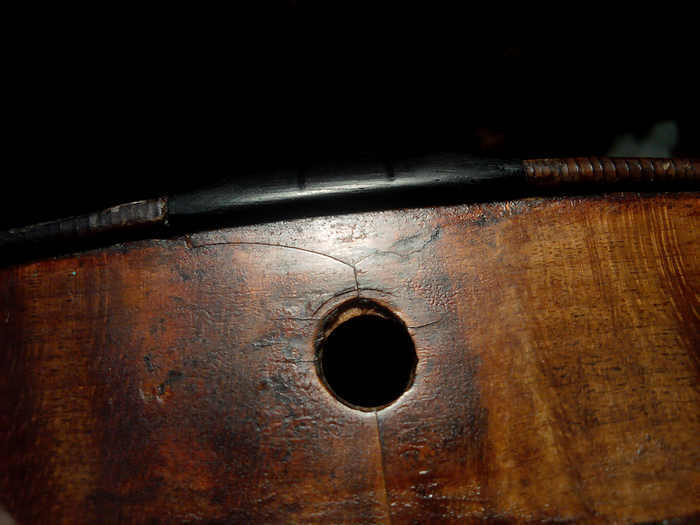 In Cremona, the early makers glued the saddle onto the surface of the rib, extending it directly upwards through the top. These saddles are all gone, but once in a while, as on this beautiful Carlo Bergonzi violin, one gets to see the shadow of what originally was there, in the form of the cut-line arc coming down from under the left end of the present saddle. There’s also a faint trace of the mirroring line on the other side, not too easy to see. 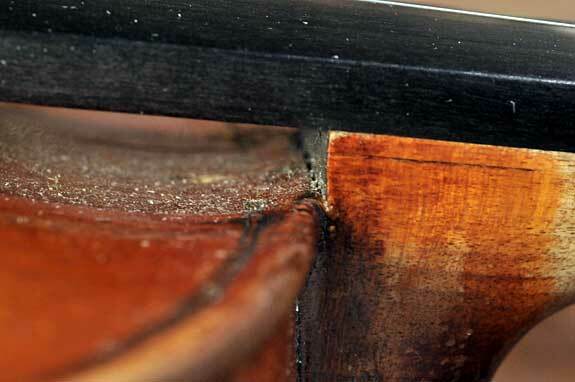 This f-hole is on a Brothers Amati cello dated around 1615. It’s one of the most beautiful I’ve seen and is perfect in execution. I’ve used it on a cello, and reduced it to fit on a violin, and a violino piccolo. In each case, when it’s the right size, it superimposes over the original model’s 4/4 and piccolo f-holes precisely, with no changes. 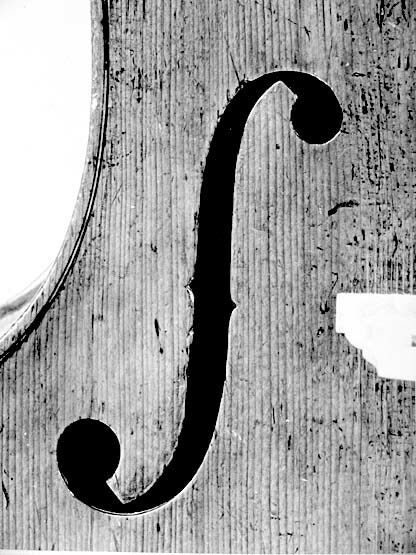 That’s something would not have thought would happen; usually parts between violin family instruments don’t transfer well with a simple percentage change. Here’s an interesting one. 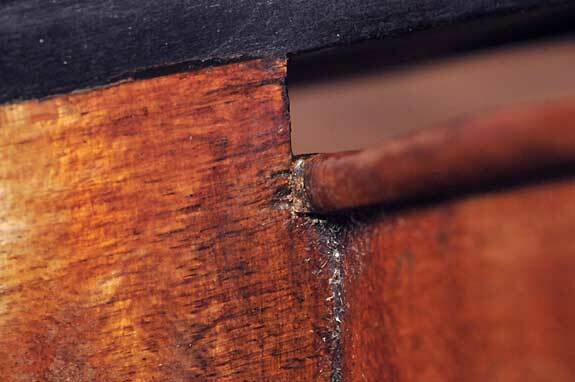 It’s rare to see pre-modern violins with their original necks instead of grafted modern ones. Usually an old neck is modernized by unmounting it from the rib (they’re glued on the outside and nailed from the inside for security), adding some on the bottom, and resetting the neck in the modern, stronger, way, inset into the rib, top, and upper block. 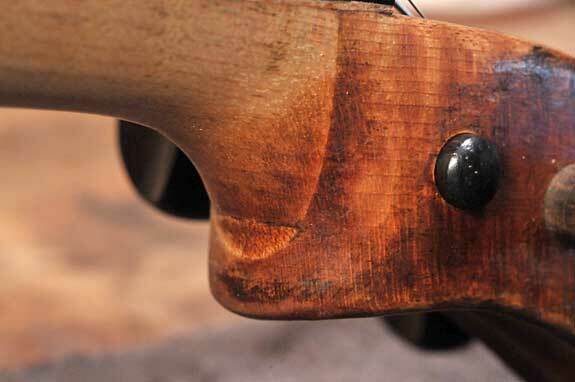 The most visible artifact of this is the way a rebate is cut into the top for the neck heel to pass through. Finally, the heel of the neck is recarved smaller to modern specifications. This cuts into the heel and exposes the holes made by the nails, and they show as rusty holes in the top of the heel. Even more common is removing the old neck completely and grafting a new one, leaving no trace at all of the original setting. This 1737 Gennaro Gagliano is different. The person who modernized it chose to leave the heel just as it originally was, nailed on to the outside of the ribs, passing around the edge of the top. Originally it wasn’t quite a baroque setting, since the heel stuck out past the top about three millimeters instead of being level with it. This is not far enough to be modern, so the person who did the work faced the front of the neck with about two more millimeters of wood to raise the fingerboard further off the top. Notice how the undisturbed outline of the top is fully intact under the fingerboard. This is an unusual way to deal with the situation because so far the neck hasn’t been disturbed or lengthened at all. In fact, the nails inside, through the block, are still in place. So where is this neck made longer? At the other end.